The 13th ranked Iowa State Cyclones are on the road to play Baylor in the Big 12. 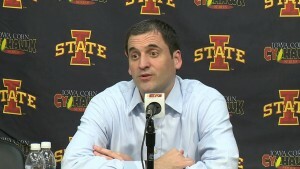 Both teams are 7-5 and part of a three way tie for fourth place in the conference standings and Cyclone coach Steve Prohm says there will be plenty riding on the outcome. The Cyclones are coming off an 85-75 victory over the Texas which featured the return of senior center Jameel McKay from suspension. Baylor beat the Cyclones 94-89 in their first meeting in Ames last month but the Bears are coming off an 84-66 loss at home to Texas Tech. Both teams are 18-7 overall and tip off in Waco is at 8:00 p.m. The game will be televised by ESPN2.